“One woman grabbed the microphone and demanded the room watch the film Passport to Pimlico, famously about the logical development of absurd ideas” – report of HS2 meeting, Cecil Sharp House (Camden New Journal 30 January 2014). Primrose Hill is up in arms about the possible damage to Camden in general, and in particular the health and quality of life of residents of the borough, if HS2 and the rebuilding of Euston Station go ahead as planned. To many, HS2 is indeed an ‘absurd idea’, the the library’s choice of the much-loved Ealing Comedy ‘Passport to Pimlico‘ as their ‘HS2 Special Screening’ is apt. 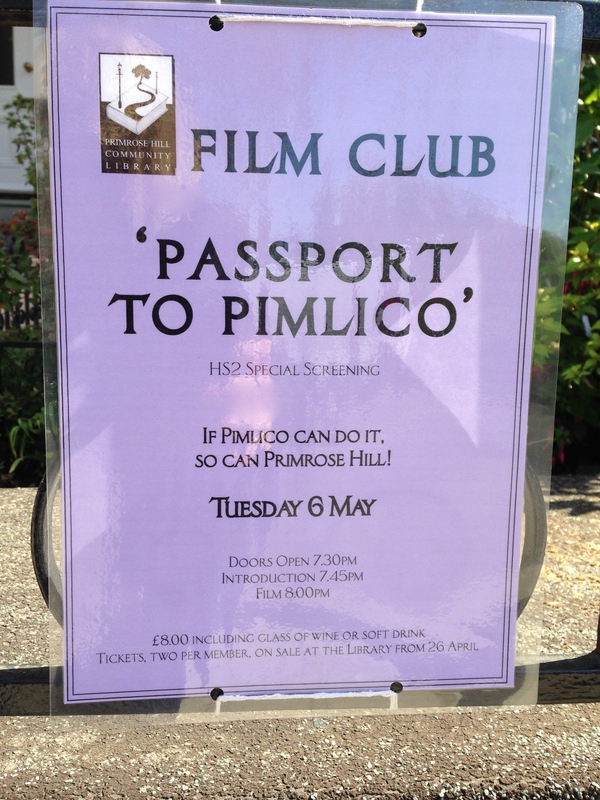 Passport to Pimlico, Tuesday May 6, doors open 7.30pm, film 8pm, with an introduction by Dr. Paul Rennie, Lecturer at Central St Martin’s. And remember, to buy a ticket you need to be a member of the library, and tickets sell out very fast.